Heavy Duty Water Spot Remover instantly erases alkaline water mineral stains from paintwork, glass, and polished metal surfaces. First wash away any abrasive dirt and debris particles from the surface with a car wash, quick detail spray, or waterless wash solution. Then simply work the Heavy Duty Water Spot Remover gel over stuck-on water spots with a microfiber applicator pad to remove them permanently. 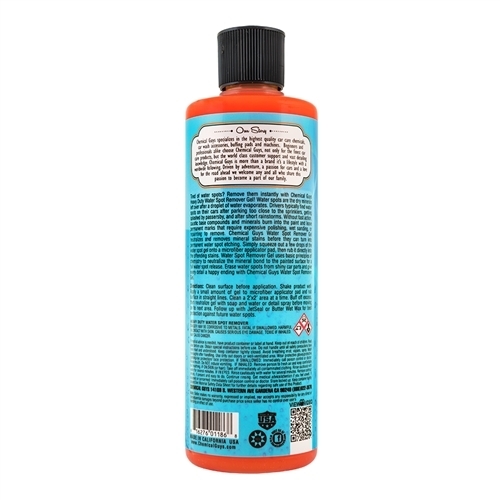 Buff away any water spot gel residue, then neutralize the gel by rinsing clear with water, or re-cleaning the area with more detail spray or waterless wash solution. Follow up with a coat of wax or sealant to help protect the surface from future water spot contamination and etching. Most water spots left by lawn sprinklers, rain storms, and car washing are basic alkaline mineral stains. To counteract bases, chemists use acids of complementary strength. 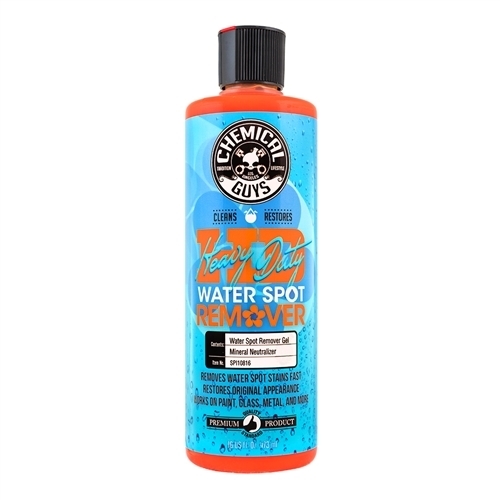 Heavy Duty Water Spot Remover is made with a mild acid that reacts with typical water spot minerals, neutralizes them, and removes them from paintwork, glass, and other polished exterior automotive surfaces. The simple chemistry effectively removes water spot minerals without resorting to abrasive compounds, polishes, or even wet sanding steps that more severe spots require. Heavy Duty Water Spot Remover is the perfect product to test and check for the gentlest water spot removal method for spots on any vehicle.